A record number of hanging b askets are to be hung in Wotton next week promising an even better display of colour and perfume than last year. For the sixth year running the Wotton in Bloom team, comprising entirely volunteers, has spent many months behind the scenes campaigning to raise sufficient money to ensure that hanging baskets can be placed around the town and kept fed and watered for the summer months. 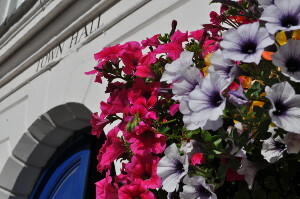 This year a total of 125 hanging baskets, four troughs and nine mangers are due to be put in place on Monday 9 June. She added: “Any more money we can raise will help to keep them up beyond then. And should the weather mean that they are not worth carrying on with then that money will go towards next year’s activities. The project is a collaboration between the town’s Regeneration Partnership and Chamber of Trade. Progress and updates can be followed on the Wotton in Bloom Facebook. Anyone wishing to join the team or make a donation to the project can contact Sue Hunt by email at suehunt2@btinternet.com or by telephone on 01453 521263 or they can make a direct donation through the One Stop Shop in the Civic Centre or The Market Place in Long Street.